Eventide uses PACE’s iLok licensing system, with or without and iLok hardware dongle, to license plug-in products. Each license provides two activations which can reside on either your computer or on an iLok license dongle. Once you’ve purchased your plug-in, you’ll need to register it on Eventide’s website, activate your license, and install the plug-in on to your computer. 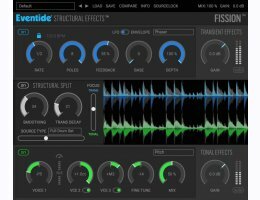 Physion (formerly known as Fission) is the first plug-in to use the ground-breaking Structural Effects technology - A new method for processing audio. It allows you to split a sound into its transient and tonal parts, independently manipulate them using Eventide's world-class effects and then fuse them back together. With the ability to add effects and dynamic controls to the transient and tonal sections, you can produce a wide range of effects, from the subtle to the extreme. Eventide’s patent-pending technology, Structural Effects, does something new. It separates a sound into its transient (impact/unpredictable/jagged) and tonal (sustaining/stable/smooth) parts more effectively and accurately than previous methods. Take, for example, a snare drum. We perceive the smack of the stick hitting the drum head and the resulting snare sizzle as the "transient" part of the sound. The ringing of of the body of the snare is perceived as "tonal." Our new method employs a technique which can be broadly classified as morphological component analysis to cleanly separate these "sonic shapes." Structural Effects technology is different because it works in a fundamentally new and different way. It’s not an EQ or compressor or limiter or transient shaper, per se. It's a a method for precisely deconstructing sound by using what can be described as a sonic "sieve" in the sense that the audio is "filtered" not by frequency but rather the audio is "filtered" based on "shapes". Physion is a versatile tool for sound designers. Splitting and manipulating audio allows you to create and explore sounds never heard before. Remove transients from pianos or guitars to create bowed sounds,or go even further by adding extreme effects to the independent channels. Physion allows you to easily re-tune a drum without affecting the transient. Delay the cracking transient of a rimshot while leaving the tonal ring as-is. Solo out the transients to tighten up a sound and add some compression to tighten further. Physion is not a traditional transient shaper - it’s a transient separator. It goes beyond what has been possible by allowing you to surgically tune the transient and tonal response independently. Use various instances of Physion to morph and transform your loops using independent tonal and transient delays. Split audio into "Transient" and "Tonal" components. Radically re-shape a sound by soloing the Tonal and Transient channels. Tighten up drums by dropping the tonal section, or tune a guitar into an ambient sweep by losing the transients. Split, modify and reassemble any sound. Six Transient effects available: Delay, Tap Delay, Dynamics, Phaser, Reverb, Gate + EQ. Seven Tonal effects available: Delay, Compressor, Pitch, Chorus, Reverb, Tremolo, EQ. Waveform display for clear tracking of Transient/Tonal audio in real time.